Erik Jones picked up the 1st last-place finish of his Monster Energy NASCAR Cup Series career in Sunday’s Toyota Owners 400 at the Richmond International Raceway when his #77 GameStop / Prey Toyota was involved in a single-car crash after 4 of 400 laps. 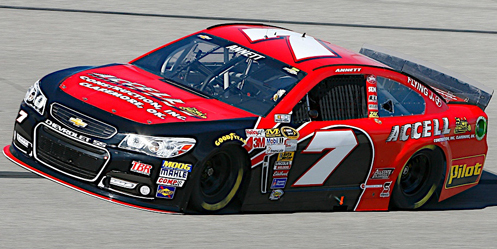 The finish came in Jones’ 11th series start. The fact that Jones, now competing in his first full season in Cup, was a dark horse pick to win on Sunday speaks volumes about his talent. In 2013, he won his first ARCA race at Berlin in his 13th start. He made his Truck Series debut later that year, winning in his fifth start at Phoenix for Kyle Busch Motorsports, then in 2014 came home 7th in his XFINITY debut at Chicagoland. 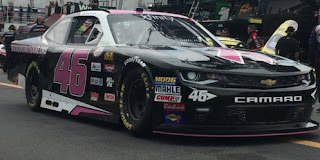 In 2015, Jones made an unexpected Cup debut at Bristol, driving in relief of Denny Hamlin, then a month later at Kansas made his first start in place of Kyle Busch. 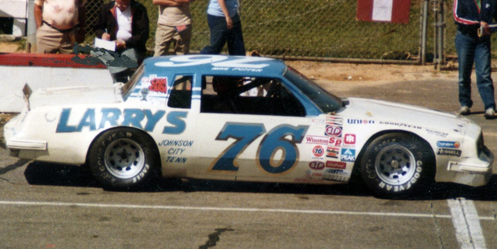 Jones led a lap that night and was still competing for the lead when he crashed with just over 70 laps to go. With seven Truck Series wins and the 2015 title, plus another six checkered flags in XFINITY, Jones was signed to debut a second team for Furniture Row Racing, running alongside Martin Truex, Jr.
After a mid-race crash left him next-to-last in the season-opening Daytona 500, Jones began a streak of five consecutive Top 15 finishes, including a season-best 8th at Phoenix. Last week at Bristol, he looked poised to score his first Cup victory - and a weekend sweep with XFINITY - running inside the Top 5 for much of the distance before a wreck on Lap 422 left him 17th. With that run in his back pocket, even more eyes were watching him at Richmond. Jones was one of just 38 drivers looking to make the race, the shortest Cup field at Richmond since that number of cars took the green on September 9, 1995. He ran 2nd to teammate Truex in opening practice – despite a spin and a nudge into the outside wall in Turn 2 - and qualified 20th with a speed of 118.948mph. 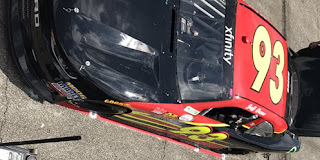 He sat out Saturday’s XFINITY race, handing over the wheel of his Joe Gibbs Racing entry to newcomer Kyle Benjamin, and led Saturday morning practice, followed by a 4th in Happy Hour. Starting 38th and last on Sunday was Austin Dillon in the #3 AAA Chevrolet. Dillon was served a qualifying penalty after Bristol when his car failed to pass LIS inspection five times, meaning he would start at the rear regardless of speed. With NASCAR’s rule requiring drivers take the green on the tires they use in qualifying, Dillon took a single slow lap on Friday at just 82.792mph, more than 10 seconds off Matt Kenseth’s pole speed. Dillon’s lap actually would have taken the pole at Richmond – on April 13, 1969 (polesitter David Pearson turned a lap on the old fairgrounds configuration of 82.538mph). Dillon’s penalty also cost him pit stall selection and 30 minutes in practice. Crew chief Richard “Slugger” Labbe was also absent from the track, preparing the team’s #3 for next Sunday’s race at Talladega. Sammy Johns sat on the pit box. When the green flag fell, Dillon and his fresh tires passed 37th-place starter Timmy Hill in the #51 SleepFresh Mattress Chevrolet for Rick Ware Racing, dropping Hill to last by the exit of Turn 2. At that same moment, Erik Jones found himself in a three-wide battle off the same corner, passing Kasey Kahne and Danica Patrick. Kahne slid into Jones off the corner, forcing Jones into the wall and costing him a handful of spot. On Lap 5, as the field poured into Turn 3, Jones had regained the lost positions to the 20th spot, a tire went down as he ran the high lane, sending him hard into the outside wall. 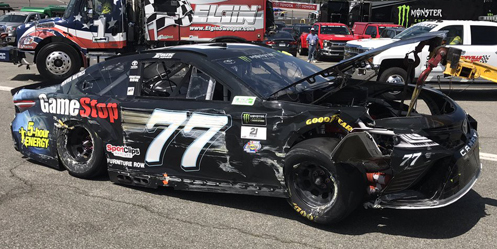 Jones was uninjured, but his #77 was towed behind the wall, done for the day. 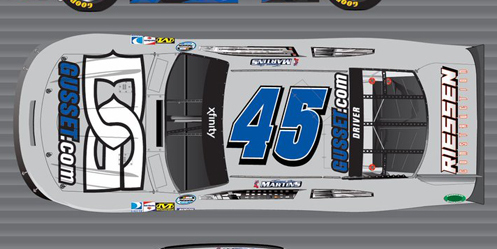 Finishing 37th was the #47 Kroger ClickList / Butterfinger / Cheerios Chevrolet of A.J. Allmendinger, 67 laps down, his first of two trips to the garage for an overheating rear gear that had to be swapped out. 36th went to outside-polesitter Ryan Blaney, who lost a tire with 22 laps to go, chased his #21 Motorcraft / Quick Lane Tire & Auto Center Ford up the track, and smacked the outside wall. 35th belonged to Jeffrey Earnhardt, debuting new sponsor Towne Bank on his #33 Chevrolet, one lap behind Timmy Hill in 34th. *This marked the first last-place finish for the #77 in the Cup Series since June 8, 2014, when Dave Blaney’s #77 Amy R. Fochler / www.Valor4Vets.com Ford finished under power, 18 laps down, in the Pocono 400 at Pocono. 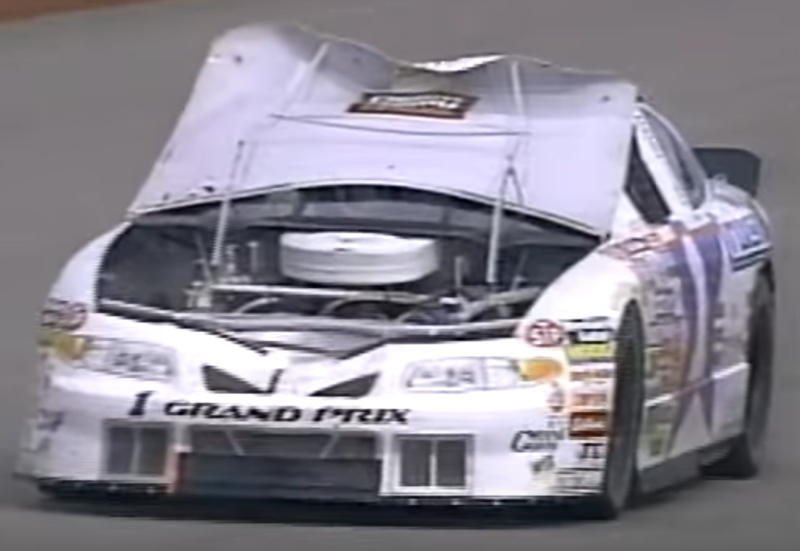 The number hadn’t finished last at Richmond since September 12, 1998, when Robert Pressley’s #77 Jasper Engines Ford was involved in a multi-car crash after 33 laps of the Exide NASCAR Select Batteries 400. 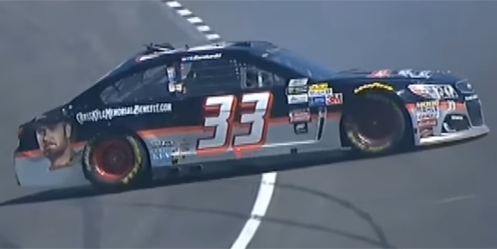 Jeffrey Earnhardt picked up the 3rd last-place finish of his Monster Energy NASCAR Cup Series career in Sunday’s O’Reilly Auto Parts 500 at the Texas Motor Speedway when his #33 Superior Logistics Services / Chris Kyle Memorial Benefit Chevrolet was involved in a multi-car accident after 9 of 334 laps. The finish, which came in Earnhardt’s 31st series start, was his third of the season and his third in four races. It’s also his fourth last-place finish across NASCAR’s top three divisions, tying him for 25th overall with, among other drivers, his father Kerry. Last week at Martinsville, Earnhardt avoided his third-consecutive last-place finish, but a hard crash into the Turn 2 wall left him a disappointing 36th at the finish. 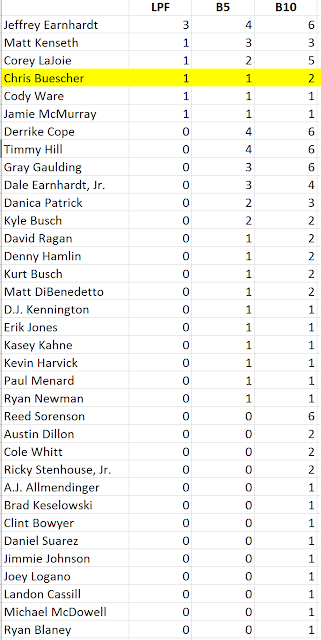 Since finishing 26th in the Daytona 500, the Circle Sport with The Motorsports Group team has not finished better than 32nd, leaving the driver 37th in points. However, Circle Sport’s Charter, combined with just 40 cars arriving in Fort Worth, guaranteed that #33 would be in the race once more. In practice, Earnhardt ran 38th in the opening session, . He qualified 31st in time trials with a lap of 182.852mph. While it was the slowest lap turned that session, nine other drivers didn’t get through inspection in time, thus giving Earnhardt his best starting spot of 2017. Starting last on Sunday was the lowest-ranked of the group in Owner Points, the #55 Low T Centers Toyota of Derrike Cope. Cope, making his first Texas start since 2006, rolled off as the only driver in Sunday’s field to have also competed in the inaugural event at the track in 1997. Driver and team were back from a one-week hiatus where both had skipped last Sunday’s race at Martinsville. 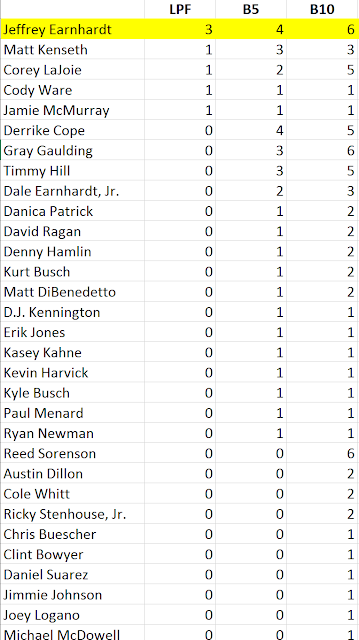 Combined with the return of Tommy Baldwin Racing (with J.J. Yeley behind the wheel) Texas marked the first 40-car field since Baldwin’s team last ran in the Daytona 500. Three cars joined Cope at the rear of the field: Kasey Kahne and Trevor Bayne had both wrecked in practice on Saturday, sending them to backup cars. Eventual race winner Jimmie Johnson was sent back as well, a spin in practice forcing him to change tires after qualifying. At the same time, another last-place story was developing. By the one lap to go signal, 25th-place starter Austin Dillon made an unexpected trip down pit road, then turned and headed to the garage. Initial reports of a broken track bar gave way to news that something had come off the passenger side truck arm, forcing the crew to make emergency repairs. In a situation reminiscent of Timmy Hill’s two runs for Premium Motorsports at Indianapolis and Michigan in 2015, the Richard Childress Racing crew missed the start, but looked to make a return. If they were unsuccessful, Dillon would not only be handed his first last-place finish since Chicagoland in 2015, but would be the Cup Series’ first “did not start” in a points race since September 5, 1993, when Bob Schacht didn’t turn a lap of the Mountain Dew Southern 500 at Darlington in Thee Dixon’s #85 Burger King Ford. On Lap 12, the work was done, and Dillon pulled out of the garage and onto the track, 11 laps behind. 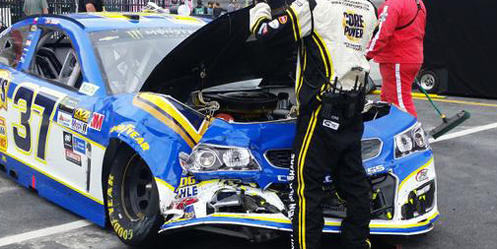 He returned under what was already the second caution of the day, triggered by a three-car accident. Jeffrey Earnhardt had broken loose in Turns 1 and 2, sending his car backwards into the outside wall. Also collected was Reed Sorenson, the debut of new sponsor Xchange of America on his #15 Chevrolet marred with damage to the left-rear, then a lost right-rear wheel under caution. Gray Gaulding also suffered damage to the right-front corner of his #23 Dr. Pepper Toyota as he tried to clear the wreck to the inside. Earnhardt, however, climbed out of his car, which was then towed through the backstretch wall to the infield, done for the day. On Lap 22, Earnhardt took last from Dillon, who went on to finish 33rd. Finishing 39th was Timmy Hill, the only other retiree from the race. Hill’s #51 Fenton Motors Chevrolet for Rick Ware Racing lost an engine during the early laps of Stage 2. 38th-place Kasey Kahne went to the garage late with a broken axle, but still limped the #5 Farmers Insurance Chevrolet home in the 38th spot. Cope came home 37th, having run the extreme high lane in Turns 1 and 2 to let faster traffic go by. Rounding out the Bottom Five was Paul Menard, his #27 Dutch Boy / Menards Chevrolet returning from several laps in the garage with a new battery cable. 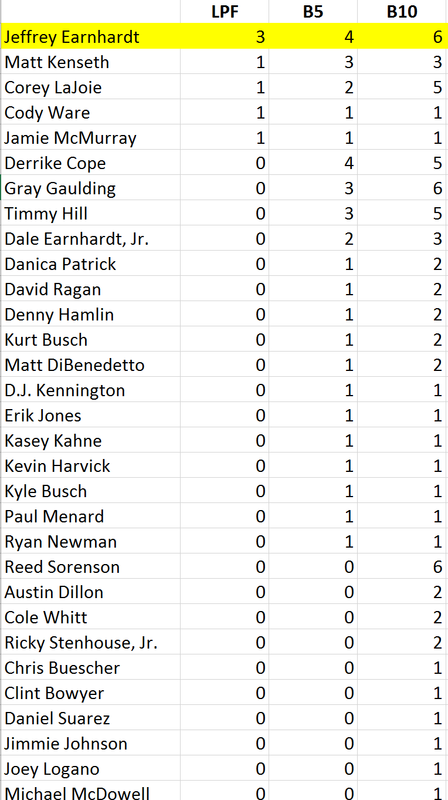 *The nine laps completed by Earnhardt are the fewest by a Texas Cup race last-place finisher since November 4, 2012, when Reed Sorenson turned six laps in Humphrey-Smith Racing’s #91 Plinker Tactical / MCM Elegante Toyota before electrical issues. *This marked the first last-place finish for the #33 in a Cup Series race at Texas. On June 7, 1981, Baxter Price picked up the 5th last-place finish of his NASCAR Winston Cup Series career in the Budweiser NASCAR 400 at the Texas World Speedway when he “quit” driving his #50 Broadway Motors Chevrolet after 1 of 200 laps. The finish, which came in his 90th start, was his first since that February at Richmond, 11 races earlier, when his #45 McWhirter Grading Buick broke a driveshaft after 16 laps of the Richmond 400. Price excelled in the Grand National East Series, a circuit consisting of tracks recently cut from the Winston Cup tour. In 1972, he scored three Top Fives and 11 Top Tens on his way to a 4th-place showing in the standings. The series was stacked with Cup Series veterans, including season champion Neil Castles and fellow owner-driver Elmo Langley, who finished 1-2 in points. 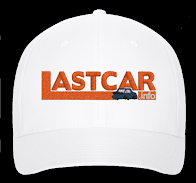 Among the drivers Price outpointed that season were Wendell Scott, Richard Childress, Tiny Lund, Buck Baker, and Bobby Allison. With this success, Price made his Cup debut at Richmond on September 9, 1973. 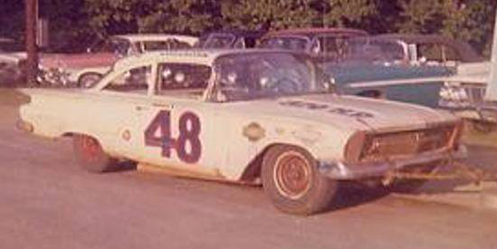 He filled out the 34-car field in his #33 Price Racing Chevrolet, starting in the final spot. On Lap 4, Price spun in the fourth corner and couldn’t restart. With the track still in its tight half-mile configuration, outside-polesitter Darrell Waltrip couldn’t avoid Price’s car and slammed into the rear of #33. The result was a 14-car pileup that also triggered a fuel fire in Baxter’s car, leaving the last-place finishing rookie with second-degree burns to his face and hands. It was an inauspicious start to a brief career. Price didn’t run another Cup race until May 10, 1975, when he returned at the Nashville Fairgrounds to run the Music City USA 420. Now driving the #45 he would campaign for much of his career, the driver started next-to-last in the 28-car field and climbed to 20th despite running just 38 laps. 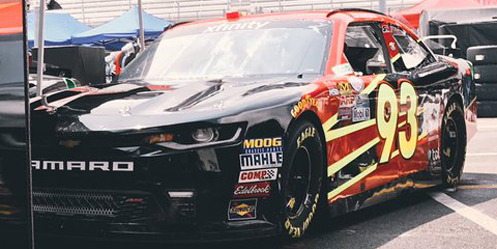 He improved to 22nd in his return to Nashville that summer, then ran 18th in his superspeedway debut at Pocono, the first track where he finished under power. He slowly built his program over the next two seasons, running six races in 1976, 12 in ’77, and 24 for back-to-back seasons in 1978 and 1979. He also picked up a series of local sponsors for his #45, including Tire King, Ray Cook’s Bar-B-Q, Ideal Maintenance, and Iron Peddlers, the last of which being his most consistent backer through the 1979 and 1980 seasons. The Virginia 500 at Martinsville on April 23, 1978 saw Price earn what would be his best career finish, an 11th-place run, 45 laps behind Darrell Waltrip. 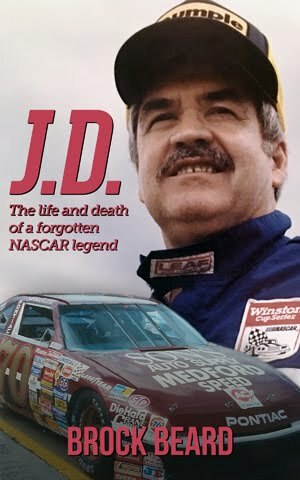 At Charlotte that October, Price was also tabbed to drive in relief of none other than Dale Earnhardt, who was preparing for his Rookie of the Year campaign. Two competing deals arrived for Earnhardt to run Charlotte in Will Cronkrite’s #96 Cardinal Tractor Ford and run Atlanta in Rod Osterlund’s Chevrolet. Since running both races would exceed the maximum number of starts Earnhardt could make and still run for rookie honors, Price was tabbed to start the #96 at Charlotte. And so it was on October 8, 1978, that Baxter Price and Dale Earnhardt split time in the same car for 179 laps before the engine let go. 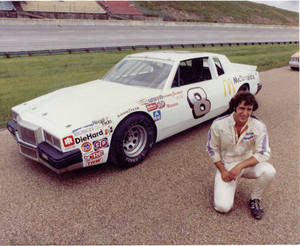 By 1981, when NASCAR downsized its cars from 115-inch to 110-inch wheelbase models, Price had scaled down his operation. A fourth bid to make an elusive Daytona 500 start ended in disappointment, though he finished 4th in the 12-car “Consolation Race” run the Friday before the race. A last-place finish at Richmond turned out to be the final green flag taken in his black-and-gold #45 Buick. Then, in June, came a call from another owner-driver. Jimmy Means was in his sixth season of competition on the Winston Cup tour, and headed toward the second-best season of his Cup career. 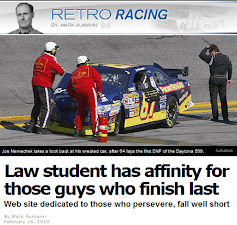 By June, he was 14th in the point standings, and he’d finish there at season’s end. While preparing his #52 Broadway Motors Pontiac for the upcoming race in College Station, Texas, Means tabbed Price to drive a second car for him. Price would drive a renumbered #50 Chevrolet, likely the same Chevrolet that Means ran four times earlier that season at Daytona, Bristol, North Wilkesboro, and Nashville. The agreement was made and both drivers arrived at the track. The venue was the Texas World Speedway, a blistering-fast two-mile oval similar in construction to Michigan International Speedway, but with steeper corners banked between 12 and 22 degrees. The circuit joined the Winston Cup schedule in 1969, where Bobby Isaac prevailed in a 38-car contest. Over the next four seasons, the fields grew as large as 49 cars with both Richard Petty and lead-footed Buddy Baker taking the checkered flag. But the track was dropped from the schedule in 1974, and when it returned five years later, the fields were noticeably depleted. Just 34 cars took the green in 1979, then 31 in 1980. Means and Price were among just 34 drivers to arrive in 1981. 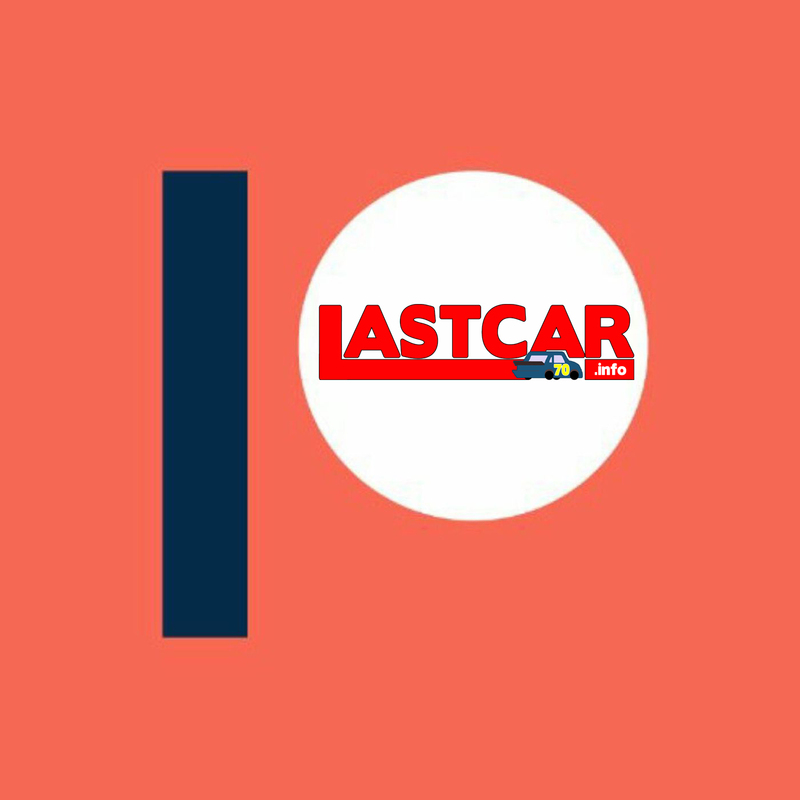 According to the official results, it appears that Price’s car was one of at least three brought in to fill out the field. Unlike the more recent examples of “start-and-park” teams, which often list mechanical failure as the reason out, it was then common for such cars to list the more direct “quit.” Price pulled out first after the opening lap. The next time by came Kirk Shelmerdine, who was making his Cup debut. Like Price, Shelmerdine arrived in a second car belonging to an owner-driver, his future boss Richard Childress: Shelmerdine drove a #8 McDonald’s Pontiac renumbered from Childress’ #3. By 2002, Shelmerdine would start his own team. Third among the “quit” group was D.K. Ulrich. 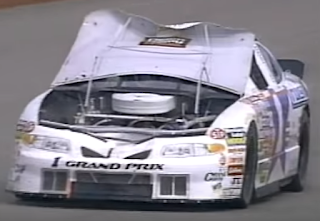 Ulrich’s exit is a strange one as, just one month earlier, he’d piloted his #98 UNO Buick to a career-best 4th at Dover. 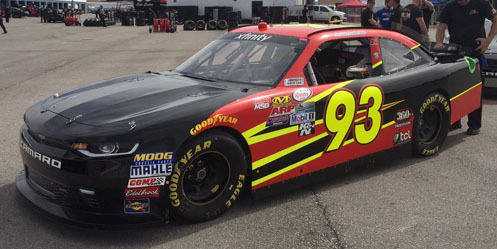 Rounding out the Bottom Five were 39-year-old Morgan Shepherd, fresh off his first Cup victory that April. Shepherd’s #5 Performance Connection Pontiac prepared by Cliff Stewart exited with radiator issues. Rounding out the Bottom Five was Darrell Waltrip, one of only four DNFs in a 12-win season that vaulted he and his Junior Johnson-prepared car to the first of three Winston Cup titles. As it turned out, June 7, 1981 was both Baxter Price’s final Cup start and the final Cup race at the Texas World Speedway. Price’s 90-race career set a mark for the most Cup starts without a Top 10 finish - a record which stands to this day. Texas World Speedway hosted ARCA and K&N Pro Series West races until 1993, and in 2009 made the news when Greg Biffle turned a lap of over 218mph during a test session. While one report in January 2016 indicated the track would be torn down to make way for a housing development, as of this writing, the track’s online calendar still has private tests and other track events scheduled for the rest of 2017. *This was the first last-place finish for the #50 in a Cup Series race since August 3, 1980, when Bruce Hill lost the engine on his #50 Global Heat Exchanger Oldsmobile after 12 laps of the Talladega 500 at Talladega. 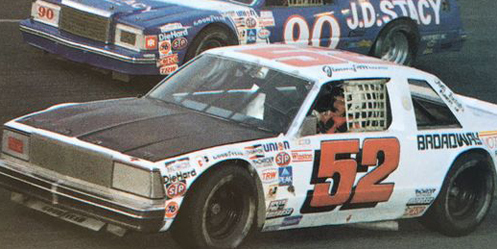 The number would not finish last in Cup again until October 11, 1987, when Greg Sacks’ #50 Valvoline Pontiac crashed after 20 laps of the Oakwood Homes 500 at Charlotte. This was the first and only last-place finish for the #50 in a Cup Series race at Texas World Speedway. 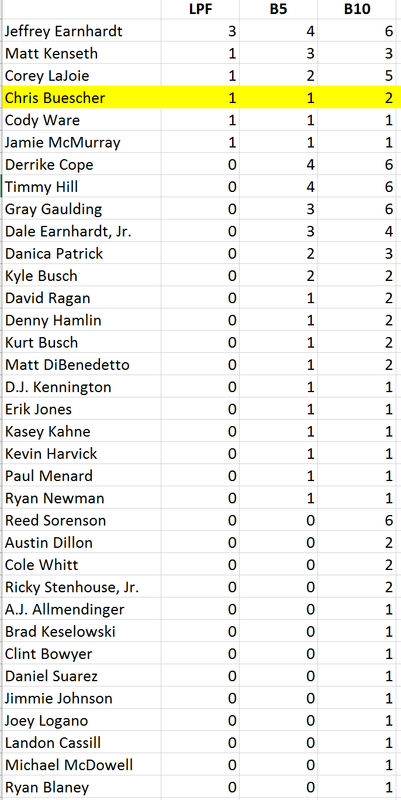 *In 2,505 Cup Series races, “quit” has been the listed reason out for just 59 last-place finishers. The first time it was used was February 24, 1967, when Daytona 500 polesitter Curtis Turner pulled off the track in Smokey Yunick’s #13 1966 Chevrolet after one lap of his qualifying race. The last time was June 13, 1993, when another Jimmy Means backup car, this time driven by Graham Taylor, pulled the #53 State Shuttle Ford off track after 3 laps of the Champion Spark Plug 500 at Pocono.